Wood or steel utility poles often need repair or replacement. Years of use and inadequate maintenance take their toll on the poles. A combination of cyclic climate changes and infestation by various insects also contribute to the deterioration of wooden poles. The result is a continuous weakening of the wooden utility poles. Consequently, a large number of wooden poles fail every year in storms, tornadoes, hurricanes, etc. Failure of utility poles leads to disruption of service to customers and continues to remain a major concern for utility companies that own and operate these poles. Click here to see repaired utility poles that were damaged by termites. Measure, Mark and Cut the Jacket. Place the QuakeBond® epoxy cartridge into the pneumatic dispenser and dispense mixed epoxy on only HALF the jacket. Spread mixed epoxy with a putty knife on HALF the jacket. Wrap the jacket around the pole. Afterwards, tie a few zip ties around the jacket to hold it in place while the epoxy cures. The annular space between the jacket and the timber pole is filled with QuakeBond 320LV (Low Viscosity) Resin; this will bond the jacket to the pole and fill all the cracks and crevices of the deteriorated pole with resin. This engineered resin is 3x the strength of most timber species. Currently available jackets and shells fit a specific pole size. Contractors must plan in advance and order the correct size jacket for each application. 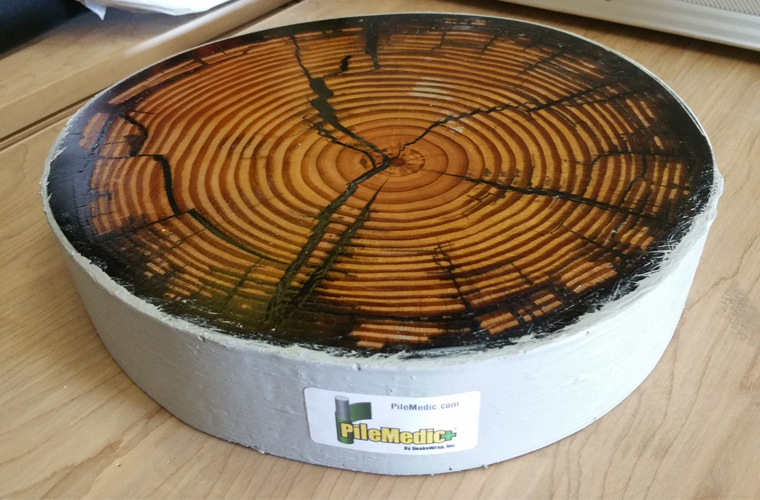 PileMedic® uses the same size laminate for all poles and columns and accommodates circular, rectangular, and H-section poles. It is extremely versatile. PileMedic® is versatile; “one-size fits all”. This is a great help in emergency repairs after a disaster like a hurricane or earthquake, where many poles must be quickly shored up. The PileMedic® repair system is instantly available from stock. Current repair shells usually have two or more sections bolted together. This makes them weak, and does not allow pressurization of the filler material. In contrast, the SuperLaminate™ shell is wrapped around the damaged pole to form a “seamless” one-piece shell that is extremely strong and can accommodate high pressure injection. The injected resin penetrates deeply into the damaged wood. Many existing systems use metallic bands and straps or steel bolts to connect the pieces together. These metal parts are subject to corrosion and deteriorate over time. This is a major concern in coastal and marine environments and other corrosive environments. In contrast, the SuperLaminate™ shell uses only composite FRP materials that have excellent corrosion resistance and do not rust. There are no metallic straps or bolts. Utility poles are often damaged below the surface. Conventional repairs require a trench to uncover the problem area and allow it to be restored. PileMedic® eliminates this expensive and time consuming process. It installs directly, and penetrates the earth to surround the subsurface defects and fill them with resin. No more trenching! Because the tensile and compressive strength of QuakeBond™ 320LV resin is nearly three times that of most wood species, the filling of the voids in the pole with this resin leads to a pole that is significantly stronger than the original pole. The QuakeBond 320LV Low Viscosity Resin that is injected into the annular space can penetrate all voids and crevices of the wood, producing a solid section. As shown in this figure, this procedure has been successfully documented. Because of the high strength of the epoxy used for injection, the filling of the voids with epoxy results in a net gain in strength for the pole. In addition, the strength of the PileMedic® jacket that is bonded to the exterior of the pole contributes to flexural resistance of the pole. If desired, reinforcing steel bars can be embedded in the sides of the pole in slots that have been cut in advance; the resin injection process makes such reinforcing bars an integral part of the pole, further enhancing the flexural (bending) strength of the pole. Tests are currently planned with Tucson Electric Power Company to quantify the effectiveness of this system. Our R&D on confinement and repair of bridge columns with FRP jackets started over 20 years ago. 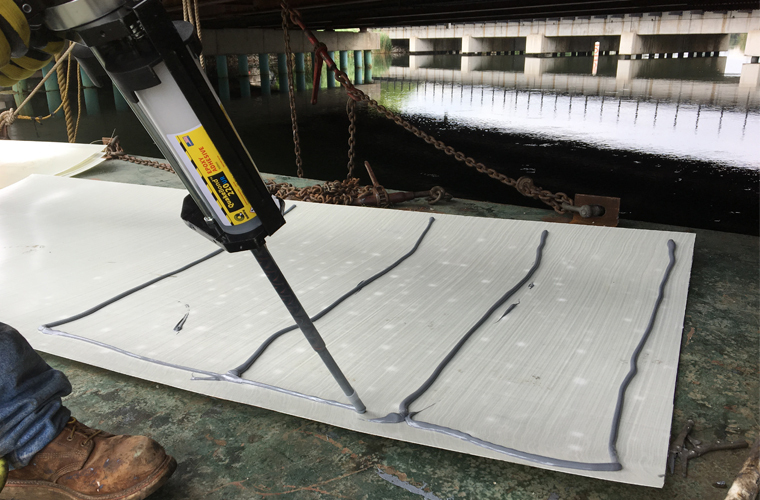 We were the first team of researchers funded by the U.S. National Science Foundation to study repair and retrofit of columns and bridge piers with FRP wraps. Keep in mind that the first generation of FRP jackets we used in the 1990s to wrap those columns was far inferior to the newly-developed PileMedic® system that we introduced in 2010. The earlier “FRP wraps” were, for example, very narrow and the uniaxial, meaning the fibers could only be positioned in the hoop direction to provide confinement for the column. In contrast, the new PileMedic® has a biaxial construction so the laminate can not only provide confinement but it can also contribute to the flexural capacity of the column. Referring to some of the earlier studies we published on tests of circular columns, this improvement is shown when you compare Figs. 9 and 10 with Fig. 8 or when you compare Fig. 12 with Fig. 11. In all cases, the enhancement caused by the confining wraps is substantial. In another paper on rectangular columns , we studied the effects of keeping the same rectangular shape or enlarging the column cross section into an oval shape (Fig. 5). Another variable was whether the resin in the annual space was placed under gravity alone (passive confinement) or pressurized to place the jacket in tension from the start (actiREve confinement). Fig. 10 is the response of the same column shown in Fig. 9 after it was wrapped. Likewise, Figs. 12 and 13 show the improvements on the behavior of unwrapped column (Fig. 11). Finally, many of the unwrapped circular and rectangular columns that were damaged at the conclusion of the initial tests, were subsequently repaired by wrapping and re-tested. This portion of the study was aimed at showing the effectiveness of FRP wraps in repairing unretrofitted columns that are damaged in an earthquake. As seen in Figs. 12, 13 and 14 deteriorated columns could also benefit significantly from such repairs with FRP jackets.